» Is Toronto in the Market for a Goalie? Is Toronto in the Market for a Goalie? Earlier this week, Toronto Maple Leafs GM Brian Burke was adamant that he was not in the market for someone to supplement and/or replace Jonas Gustavsson and James Reimer in net. “We are not looking for a goaltender at this point,” he said in an e-mail to The Globe and Mail. That was before Gustavsson turned in a clunker of a performance Tuesday night. The Leafs, who are on the playoff bubble, lost to the New Jersey Devils 4-3 in overtime as Gustavsson was weak on the five-hole in regulation and unfortunate with his positioning on the overtime goal, which was headed wide but caromed off his equipment and into the net to erase what had been a late comeback by Toronto. Cory Schneider: Probably the backup goaltender most commonly thought to be ready for a no. 1 job (especially by a particular overreacting subset of Vancouver Canucks fans themselves). Schneider has a .922 career save percentage (.928 this season, close to the .929 he posted last year) and has a 13-5-0 record this season, but it’s unlikely the Canucks, who operate under the assumption that they’ll go deep into the playoffs, would let go of such an important part of their deep roster. Schneider becomes an unrestricted free agent after this season, however, and will likely be a highly sought-after player at that point. Jonathan Bernier: The Los Angeles Kings’ backup goaltender has been floated as a trade chip for months now, though The New York Times’ Jeff Klein has concerns about whether his numbers really hold up to his esteem. The Kings already made a deal with the Columbus Blue Jackets (a team known to be looking for some solutions in net) that did not include Bernier, though the team continues to be active in the market. Josh Harding: The Minnesota Wild goalie becomes a UFA after this season as well. He had a big run for the Wild earlier this season when the team was leading their division, though his record now stands at 9-9-3. When he “tweaked something” in practice this week and minor leaguer Matt Hackett was called up, it set off rumors that he was about to be dealt. But the Wild remain in the playoff hunt, so it’s hard to know whether they want to upset the balance at this point. Anders Lindback: When the Nashville Predators signed Pekka Rinne to a seven-year, $49 million contract last year, it was the kind of long-term move that isn’t exactly catnip to a backup goaltender. Still, Nashville is using this season to make a big postseason push, and like Vancouver, it probably feels it would be better to wait until after the playoffs to make any deals, and the 23-year-old wouldn’t come cheap. 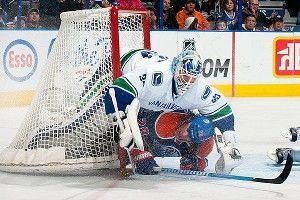 Evgeni Nabokov: Another pending free agent rental, the New York Islanders’ Evgeni Nabokov has amassed a .925 save percentage this season and has gone 14-14-0 on a young and defensively-suspect Islanders team. Nabokov has a no-trade clause, but he could certainly waive it if he were intrigued by joining a contender. On the other hand, there have been reports that the Islanders are hoping to sign him to an extension. Ryan Miller: I’d be shocked if the Buffalo Sabres traded their franchise goaltender, despite the rough season he and the team have had. But I’m holding out hope that he becomes part of one of those truly zany blockbuster trade deadline maneuvers that go down in hockey lore. NASH FOR MILLER STRAIGHT UP GET ER DONE. The save sensation of the week came courtesy of Ondrej Pavelec, whose play in net for the Winnipeg Jets has helped the team take over the Southeast Division as of last night, catapulting them up to the third seed in the Eastern Conference. (That is NOT a home arena I would want to have to enter in the first round.) Pavelec made a season-high 50 saves against the Philadelphia Flyers on Tuesday, but the Flyers tied the game with 10 seconds to play and then scored in overtime to win 5-4. Still, while he didn’t get the win Pavelec ensured he’d enshrined in the rest of the season’s highlight films for this glove grab on Jakub Voracek. Another team that has been climbing up the standings with help from a stalwart performance in goal is the Anaheim Ducks. Goalie Jonas Hiller, who suffered from a case of vertigo last season and did not seem to be at top form earlier this season (though to be fair, of course, neither did any of his teammates), has put in a number of strong performances of late as the once-floundering Ducks, fresh off a 3-2 shootout win Thursday night over the Carolina Hurricanes, are now just four points out of playoff contention going into this weekend. The story with the L.A. Kings so far this season has largely been the lack of goal support for Jonathan Quick, but on Tuesday night the team had a bizarro performance. The Kings scored four goals against the Phoenix Coyotes (and at one point held a 4-1 lead), but Quick allowed four in his net as the Kings lost in a 5-4 shootout. The funk carried over to the next evening, when Quick was pulled after a period in which the Colorado Avalanche scored three times on eleven shots. It’s been a big week for Henrik Lundqvist, who on Thursday night jammed on his guitar at a charity gig that also involved John McEnroe. “I think it’s important that you get away from the game and have other hobbies and do other things,” he said. On Friday, the Rangers goalie announced on Twitter that he and his wife are expecting their first child. Not everything was perfect, however — Evgeni Malkin saw to that with this breakaway goal. Mike Smith’s new goalie mask is amazing. That is all.